Three people have been arrested after demonstrators from the Occupy London movement briefly took over another building in the financial district. Protesters entered a site in Leadenhall Street, in the City, which they said belonged to a defunct Iraqi bank. City of London Police said on Friday night three people had been arrested on suspicion of trespassing on diplomatic premises but others had left earlier. Demonstrators have also been camped outside St Paul's Cathedral for months. Occupy London said the eight-floor building occupied in Leadenhall Street belonged to Rafidain Bank. A spokesman said the group decided to occupy the new site as protesters were being forced to move out of another empty bank building in central London - premises on Sun Street belonging to UBS. The bank was granted a possession order for the building on Thursday afternoon. 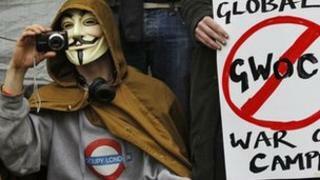 "It is likely this will be the new home for the Bank of Ideas," an Occupy London spokeswoman said earlier on Friday. "This is about public repossession, taking buildings that have been allowed to lie empty in prime city spaces and taking them back for the community. "We would like to look after it and put it to good social use." City of London Police said: "Three people have been arrested on suspicion of trespassing on diplomatic premises after a number of people entered a property on Leadenhall Street. "Officers had earlier served notice that those in the building were committing a criminal offence and several left at this point. The building is now clear. " A small group of protesters moved into Roman House, Barbican, on Saturday, but later vacated it.